A band that calls itself Vomitface faces some challenges. The band likely has to answer persistent questions about the name and get people to concentrate on the music. They were invited to play our CMJ show because we did just that. We listened to the music and saw what is there, a talented band with a wry sense of humor and a palpable energy. But we didn’t learn until later that there’s way more here than meets the eye. The band’s drummer Preetma Singh is a former attorney who left the law to pursue a career as a fashion editor, and has become renowned in certain circles for her “street style”. The band’s lead singer Jared Micah is also a prolific music writer with the legendary online zine Tiny Mixed Tapes. Together with a revolving cast of bassist friends, they produce a kind of early-80s styled agit-punk similar to early Sonic Youth, Naked Raygun or Mission of Burma. Vomitface was up second on this day show and they had the room pretty snug early in the set with an eight-song show that included only one song from their 2015 EP Another Bad Year, and what appears to be several new songs. We were all set to catch Vomitface at Pianos last night but an illness caused a cancellation, but the band will play Don Pedro’s on November 21. Acidjack recorded this show in the same manner as the other sets from the day and the sound is equally superb. Enjoy! 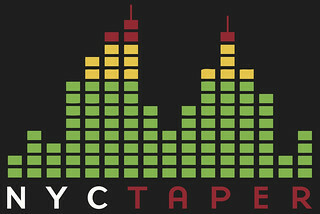 If you Download this recording from NYCTaper, we expect that you will PLEASE SUPPORT Vomitface, visit their website, and purchase their new EP Another Bad Year from Boxing Clever Records [HERE]. The San Francisco band Dirty Ghosts has existed in one form or another for the last ten years, but its real beginnings date back into the last century and band leader Allyson Baker’s parents’ house in Toronto. Baker was a young punk rocker (and big Dwarves fan) who invited touring bands to stay at the house, leading to some great stories and ultimately an introduction into the music world. Fast forward to last decade and Baker’s move to SF and the Dirty Ghosts beginnings as her solo project produced by then-husband Aesop Rock. In the intervening years, the band has evolved from a duet to a full-fledged band featuring guitar wizard Erin McDermott on bass. In September, Dirty Ghosts have released their second full-length album Let It Pretend and this Fall is perhaps the most active time period in the band’s history. We were fortunate that the band was available for CMJ and we slotted them into our show in the late afternoon when the room was overflowing. Dirty Ghosts responded with a superb set that included music from their 2015 EP Cataract, one song from their debut album 2012’s Metal Moon, and the balance from the new record. After CMJ the band remains busy with their hometown official CD release show in SF on November, to be followed by a full Europe tour in November and December with Kelley Stoltz. Acidjack recorded this set in the same manner as the other bands from this show and the sound quality is superb. Enjoy! If you Download this recording from nyctaper, we expect that you will PLEASE SUPPORT Dirty Ghosts, visit their website, and purchase their new album Let It Pretend from Last Gang Records [HERE]. 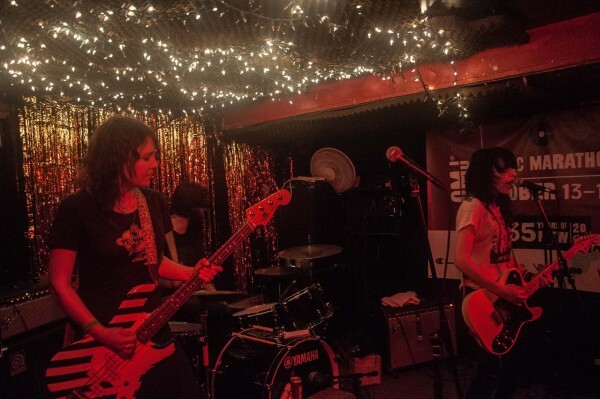 We couldn’t have been happier to kick off this year’s NYCTaper Unofficial CMJ Show at Cake Shop with the band WOMPS. 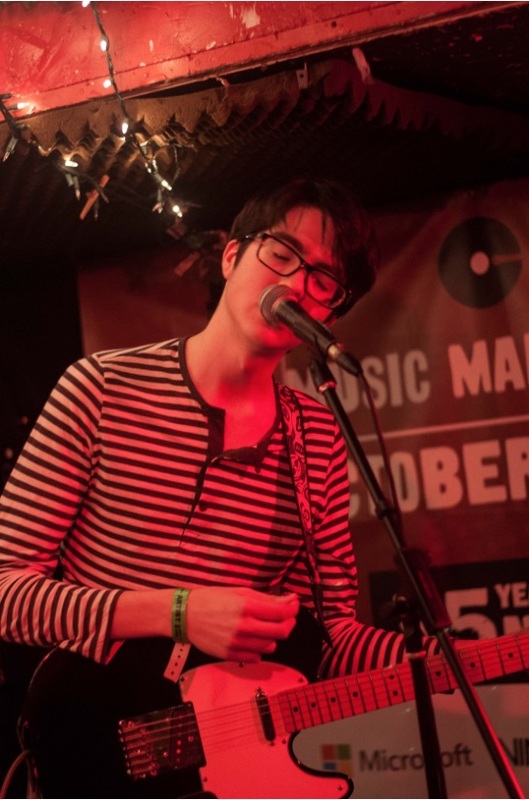 As any CMJ veteran knows, this quasi-festival can be a bit of a slog — tons of shows played at venues all over town in a compressed amount of time, often for no pay. Add to that that you’ve come all the way from Scotland to do it, and well, that’s not a recipe for a good attitude or a good performance. What a delight, then, that straight off the bat these young guys brought great songcraft and the party spirit to launch this day show. You probably haven’t heard of this band, as they’ve just a seven-inch to their name currently, but big things are expected: Right now, they’re considering offers from several labels for their already-recorded debut, for which no less than Steve Albini was behind the boards. It’s not hard to see why, as they’ve got an approachable garage-rock sound that wears its angst well. The highlight of the set for me was “Dreams on Demand,” with its tuneful hook and classic 90s sound (you can easily imagine on the radio on KROQ or the like back in those days). In their short career, they’ve shared stages with the likes of METZ, Cloud Nothings and UK breakouts Royal Blood, and the good folks over at NME are already on the case. So, WOMPS may not be a household word in the U.S. just yet, but get a taste now before we say we told you so. I recorded this set with Schoeps MK4V microphones at the front of the stage, combined with a soundboard feed of mostly vocals from Cake Shop engineer Jeff. The sound quality is not quite what I’m sure Steve Albini has done on their debut, but it’s still great. Enjoy! If you enjoyed this recording, PLEASE SUPPORT WOMPS, visit their website, and buy their 7″ here.